Bike Week in Lambeth continues this evening, Thursday 21 June 2012, with a joint Lambeth and Southwark Councils Sustainable Transport teams' barbecue and free bike check by Dr Bike in Ruskin Park, SE5. Come along 5-8pm for free food and drink in the park in celebration of cycling! 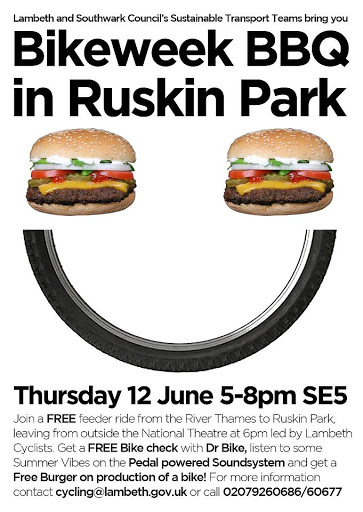 Lambeth Cyclists will be running a feeder ride to the barbecue - meet 6pm on the Southbank outside the National Theatre, SE1for a short ride to SE5.